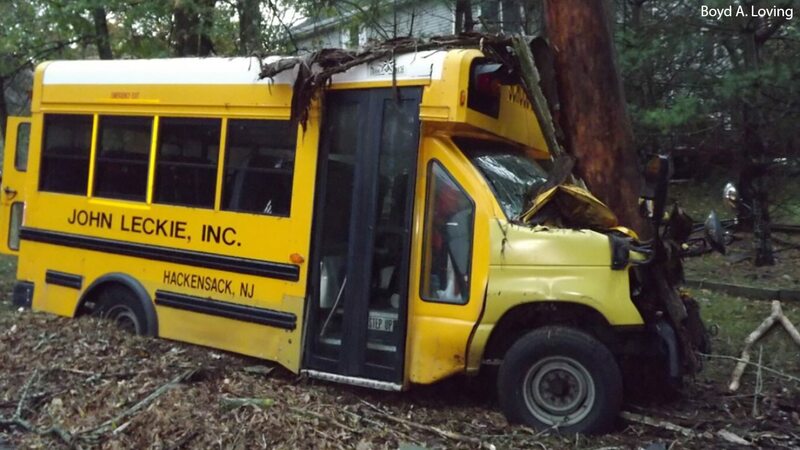 MAHWAH, New Jersey (WABC) -- A school bus in New Jersey carrying several students was rear ended and slammed into a tree on Tuesday afternoon. Police in Mahway say the accident occured at approximately 5 p.m. near the intersection of East Crescent Avenue and Masonicus Road. The school bus, carrying four students from Bergen Academies, was making a left turn when a Lexus hit the rear side of the bus, which caused it to go into a spin and collide with a tree down the road. The four children were all transported to local hospitals with non-life threatening injuries. The bus driver, a 57-year-old woman, was taken to Hackensack Hospital, while the driver of the Lexus, a 25-year-old woman, was taken to Good Samaritan Hospital with facial injuries. No summonses have been issued at this time.